Azsacra Zarathustra’s work always makes for an interesting read, and his latest books (Indo-Europe Rising and Atoms of Kshatriyas are no exception. Since these books are related in terms of content, I will review them both together in this article). In these texts Azsacra Zarathustra continues to expand on the themes developed in earlier works and a number of concepts presented in these titles are covered extensively and explained in earlier books. As such, I would to stress here that Zarathustra’s work can be intellectually challenging for beginners and people whom are not well versed in traditional metaphysics and philosophy. Therefore it is essential for readers to familiarise themselves with his earlier works in order to understand his writing in the full context. Azasacra Zarathustra: Creator of ShunyaRevoution and Absolute Revolutionis recommended as an introductory text for those who are unfamiliar with the concepts introduced by Zarathustra. For those who are already loyal readers, no such introduction is required and they will thoroughly enjoy immersing themselves in the pages of his latest writing.That being said, like Nietzsche whom I quoted above, I have no time for the idle readers — and it is the readers who appreciate different ideas and perspectives who will experience the greatest rewards from Zarathustra’s books. Here, at last we see some new ideas emerging in Traditionalism — rather than reciting Traditionalists, Zarathustra develops of some of their ideas — and challenges them when need be. 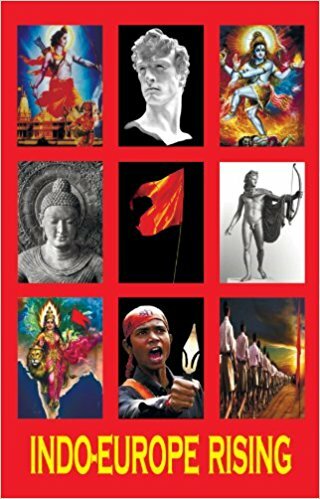 In this regard, Zarathustra’s latest book Indo-Europe Uprising is unapologetically addressed to the Hindu and European Traditions (which are linked by linguistic and religious heritage). It is from this perspective that they need to be understood — the revolution and uprising of which he writes is one rooted in tradition and spirituality, and is not politically motivated. It is a revolution that is rooted deep in the roots of the psyche of India and Europe, and like all good books it speaks not to the head but direct to the heart and to the blood. The Absolute Revolution is an interior one, not an exterior revolution — thus like Krishna’s instructions to Arjuna, it is a spiritual process. This instruction to the Ksatriya is echoed in Zarathustra’s works, who like Evola adopts the perspective that the Ksatriya caste has its own set of spiritual teachings which differs from that of the religious code of the Brahmins. This is readily supported by the Upanisads, to which Ksatriya authorship is attributed, and even to the Buddha who was born into the Ksatriya caste. It is to those people who identify with the Ksatriya role (for caste is not determined by birth in his works, but by temperament and natural inclination) that Zarathustra addresses his works and expounds the theory of the Shunya Revolution; an interior and psychological process weaving together thoughts from Hinduism, Buddhism and Nietzsche — all of which Zarathustra does not merely cite, but actively develops upon, adding new teachings to the old ones to develop a new level. What is of special interest in Zarathustra’s latest book, is that it offers a new model of Tradition which places emphasis on the ties between Europe and India, in contrast to the older Traditionalist model which favours the Abrahamic Traditions of Christianity and Islam. In terms of the history of religion, this perspective is academically correct as Vedic India and the old gods of Europe come from the same religious family, the Indo-European genus of religion. Christianity, Islam (and also Judaism) originate instead from Abraham, and form a triad which scholars refer to as the Abrahamic Tradition. The remaining Traditions fall under the rubric of Taoic, Dharmic (Hindu), Pagan (European) and Shamanic. Recent developments in the studies of religion such as the reconstruction of the Proto Indo European language and consequential dialect shifts suggest that the Dharmic Traditions and the Pagan Traditions stem from a common heritage in the pre-Vedic era, thus indicating that they are in fact related, and therefore the association of India with Europe is a genuine one which is easily backed up by historical facts. The bond between the Hindu Tradition and the European Tradition is therefore a natural one which is rooted deep in the past where it has existed since the dawn of history. The Indo-Europe Uprising of which Zarathustra writes is one which unites both Hinduism and the indigenous spiritual traditions of Europe at the core of this ancestry, and therefore it is a shared kinship between two cultures. This is the new element of Traditionalism which speaks to the Hindu and Pagan audiences, who have previously been under represented in Traditionalism and have previously occupied only a secondary role to that of the Abrahamic Traditions. Also of interest here is that Zarathustra correctly identifies Tibet as having a religious connection with Hinduism and it is included as part of the theory — thus forming a religious triad of its own as part of the Indo-European Tradition: Hinduism, the European Traditions, and Buddhism. Into this vision of a shared ancestral past is woven an intricate dialogue of Ksatriya mysticism, the metaphysical state of emptiness and the detachment from the karma-phalam advocated by Krishna. These Hindu and Buddhism thoughts are then coupled with the ideas of Europe’s greatest thinker and philosopher, Freidrich Nietzsche to create a perspective which is not only unique and original, but also profoundly Indo-European in this combination. Much of Nietzsche’s thought expresses an admiration for the Vedic past, and he too advocated the warrior temperament above that of the priest, for he saw it as a more vital mode of life and being, rather than the mode of renunciation which represents a withdrawal from life rather than engaging and conflicting with it head on. It is obvious that Zarathustra is highly influenced by Nietzsche, but he does not merely cite Nietzsche’s works — rather he develops on them by adding layers of mysticism and spiritual development drawn from the esoteric doctrines of India and Tibet, to develop a new teaching for those who identify themselves as Kstariya, in order to fight the great internal war and overcome the flawed human nature which separates them from the numinous essence of the divine which is the great spiritual uprising and the esoteric doctrine of the Absolute Revolution and the forms the Atoms of Ksatriyas. Gwendolyn Taunton was the recipient of the Ashton Wylie Award for Literary Excellence in 2009 for her work with Primordial Traditions and is a well-known author on Hinduism and Heathen/Pagan Traditions.